September is Whole Grains Month. To bring awareness to the health benefits of whole grains and provide more information on whole grain products the Whole Grains Council has put together promotions, special events and listed helpful tips and recipes on their website. What is a whole grain and where can I find it? A whole grain is defined by the kernel, or seed, of the grain plant having all three key components intact: the bran, the germ, and the endosperm. Key nutrients and fiber are found in the bran and the germ of grains. Whole grains can be found in whole wheat, whole grain cornmeal, brown rice, whole grain barley, whole oats/oatmeal, popcorn, whole rye, triticale, buckwheat, bulgur (cracked wheat), millet and sorghum. Whole grains contain a number of beneficial nutrients such as B vitamins, vitamin E, magnesium, iron, fiber and antioxidants. Fruits and vegetables usually steal the spotlight for their high levels of antioxidants and whole grains can be overlooked. However, some whole grains contain valuable antioxidants not found in fruits or vegetables. The opposite side of the spectrum to whole grain is refined grain. Refined grains will have both the bran and the germ removed from the kernel. While many refined grain food products are enriched with extra vitamins and minerals after the milling process, they will not contain as many nutrients as whole grains nor will they provide as much fiber. As awareness increases regarding the importance of whole grains consumption many whole grain versions of products are now available in stores. Whole grain bread, cereal, rice, pasta and flour are some examples of whole grain products which provide more health benefits than their refined grain counterparts. These whole grain options are all easily integrated into your existing diet simply by making substitutions to the refined grain products you may be used to using. Because of the number of nutrients they contain, whole grains offer a range of health benefits. Clinical studies have shown that diets balanced with whole grains reduce the risks of heart disease, obesity, diabetes and cancer. Heart Disease – A study led by Philip Mellen of Wake Forest University found that eating an average of 2.5 servings of whole grain foods each day can lower your risk of cardiovascular disease by nearly 25 percent. Researchers have also found that LDL cholesterol levels (the “bad” cholesterol), triglycerides and blood pressure decrease with the consumption of whole grains while HDL cholesterol levels (the “good” cholesterol) increase. Obesity – According the World Health Organization (WHO) www.who.int over 1 billion adults worldwide are overweight and at least 300 million of them suffer from obesity. Studies have found diets rich in whole grains can reduce the risk of obesity and lower BMI (Body Mass Index) levels. Diabetes – Common precursors to Type 2 diabetes are insulin resistance and metabolic syndrome. A study at Tufts University led by Nicole McKeown, M.D., found that those who ate three or more servings of whole grains a day were less likely to develop these health conditions and reduced the risk of developing Type 2 diabetes. Cancer – It is thought that the high levels of fiber in whole grains are the mechanisms of action related to lowering the risk for gastrointestinal cancers. 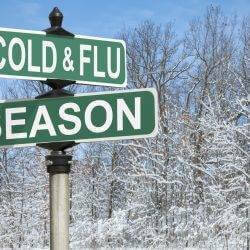 In a study led by Martha Slattery, M.D. at the University of Utah, findings showed a 66 percent reduction in the risk for rectal cancer by consuming a high-fiber diet (more than 34 grams of fiber per day). Product name – Manufacturers can add descriptive words to a product’s name in order to give it the appearance of being a whole grain food. Watch out for words such as bran, multi-grain, 100% wheat and stone-ground. True whole grain products will be labeled as “whole grain” or “100% whole wheat”. Color and texture – A common misconception is that whole grain products will be dark in color. Molasses or caramel coloring may be added to refined grain bread to give it a darker brown color. Whole grains are also stereotyped to be dry or gritty. However, some whole grain foods can be light and flaky, like cereal, or even have a thick, dense texture and a nutty flavor. Ingredients – Read the ingredient statement carefully. Whole grains are typically listed near the top and specific phrases such as “whole grain” or “whole” will describe the type of grain contained in the product. Health Claim – Look for products with advertising health claims such as the ability to reduce risk of heart disease and/or certain types of cancers. 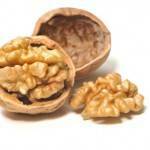 The Food and Drug Administration (FDA) regulates these claims. In order for foods to qualify for these health claims they must contain all portions of the grain kernel, meet specific levels for fat, cholesterol and sodium and contain at least 51 percent whole grain by weight per serving consumed. In 2006, the introduction of the Whole Grain Stamp made identifying authentic whole grain products much simpler. The bold golden-yellow design surrounded by a black border grabs the attention of shoppers making it easy to spot whole grain products. 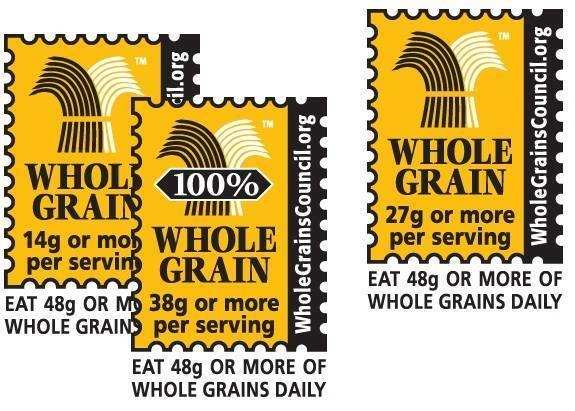 There are two versions of the Whole Grain Stamp. The 100% Stamp guarantees all the product’s grain ingredients are whole grains. To qualify for the 100% Stamp a minimum of 16g of whole grains per serving is required. The Basic Stamp signifies a product containing at least 8g of whole grains per serving, but may also contain some refined grains. The Whole Grain Stamp also makes it easy to calculate your daily intake of whole grains. It is recommended to eat either three whole grain products with the 100% stamp label a day or six products with any whole grain stamp a day in order to obtain your full daily value of whole grains as well as gain the maximum health benefits whole grain foods naturally provide. Adding more whole grains to your daily diet is easy. 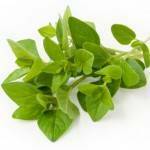 Oftentimes, the healthfulness of a meal can be increased by making substitutions. For example, try a new breakfast cereal with at least 16 grams of whole grain per serving or order your sandwich on whole wheat bread instead of white. If you enjoy cooking, check out the Whole Grains Council website to find a complete list of simple suggestions to add more whole grain to your diet.